The NSW Government’s retail trading legislation changes mean that many thousands of workers will be spending Boxing Day at work this year instead of with their families. The festive season is a time for opening presents, eating too much and relaxing for family and friends, not for stacking shelves and manning cash registers. The NSW Government claims to support families, yet here they are robbing people of Christmas together. 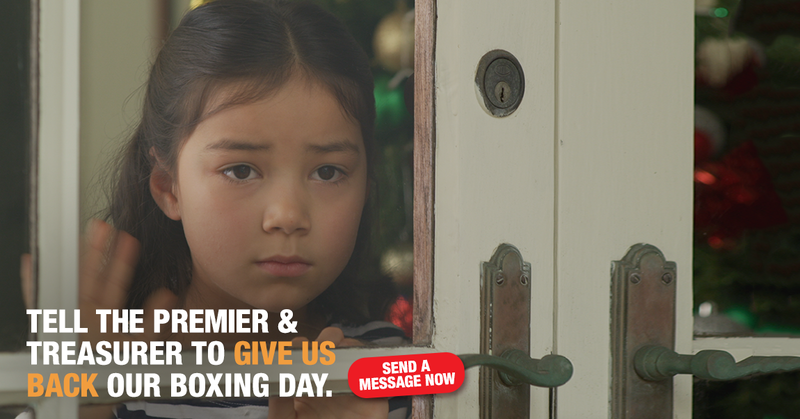 Will you take a moment to send an email to the Premier and Treasurer calling on them to give workers back our Boxing Day? If you can, add your personal story to the email – the more personal stories our politicians hear, the greater chance we have of changing their minds. There’s no benefit to opening stores on the 26th of December – all it does is rob people of valuable family time. Send an email to the NSW Premier and Treasurer now. Together, we’ll force the NSW Government to give Christmas back to families. Dear Premier, I write to you to express my concern about the impact your government’s retail trading legislation is having on families this Christmas. While many people across NSW are spending valuable time with family and friends this festive season, many thousands of workers are being forced to sacrifice their family time as a direct result of your government’s decision to allow trading on Boxing Day. We know that opening stores on Boxing Day achieves nothing other than to rob people of valuable time with their families. There is no evidence to suggest a largescale desire for people to shop on December 26th, nor any economic argument for opening store doors. We also know that despite the fact that working on Boxing Day is meant to be ‘voluntary’, the reality is that’s not the case. Getting together on Boxing Day is a great Australian tradition – it’s a time to play backyard cricket, head to the beach and share a BBQ snag with family and friends. It shouldn’t be a day when workers are forced to work behind cash registers and stock shelves. There’s no valid reason why the sales cannot start on December 27th. Treasurer we respect that you are moving seats to enable you to spend more time with your family – you should give retail workers back their Boxing Day so they can spend more time with their families too. Shops can open 360 ½ days a year, but Christmas only comes around once. Please put the needs of families in NSW first and reverse your decision to rob people of their festive season this year. After all, Christmas isn’t Christmas without Boxing Day.